The command procedure is as follows: After selecting the desired maneuver type, the instantaneous commutation angles are computed for each command interval. By using the termination criteria, we can see approximately how much time is needed to get to the target. The first approximation constitutes the initial value for the optimization scheme, which will further improve the performance of the magnetic coils by reducing the coil-on time. The command angles generated will be a minimum time set. If we want to achieve minimum energy commands, to save electric power, the parameter to optimize on for a given time interval will .be the limit angle, fMm. For a given value of fMm, the coils will be turned off when the angle between the optimal torque vector and the desired direction is greater than flim. From an initial value fHm = 180 deg, we have to proceed by reducing the angle to a threshold value, under which no convergence can be obtained to the target value. The minimum energy optimization will work only if the command time given is more than the minimum time. The control scheme described has been used for the magnetic control of the AE-5 spacecraft launched in November 1975 [Phenneger, el al., 1975; Grell, 1977]. To maintain an orbit-normal orientation, daily commands are required to compensate for a 3-deg attitude drift due to orbital precession and atmospheric drag. 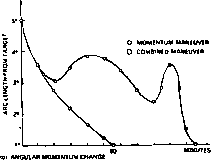 The average daily change in angular momentum is 2 kg m2/sec or about 1% of the total angular momentum. The command performance is constant for up to 15 to 20 min of command time and begins to deteriorate at about 25 min. With a total coil strength of 197.2 A m2, 5-deg attitude maneuvers or 4 kg m2/sec angular momentum maneuvers can be achieved in a 2-hour orbit. The combined maneuvers average half the efficiency of the pure orientation or momentum maneuvers, as shown in Fig. 19-4. For a typical set of optimized commands, the attitude favorable and momentum favorable sections of the combined maneuvers alternate during the orbit. The attitude maneuvers with no momentum change show the worst performance, but they may be necessary when mission constraints do not allow a change in the magnitude of the angular momentum. Fig. 19-4. 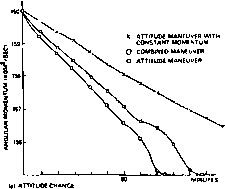 Changes in Attitude and Angular Momentum for Representative Attitude. Momentum, and Combined Maneuvers for the AE-5 Spacecraft verge to the optimal solution, and the optimization gives the closest possible solution even if there is not sufficient time available to converge to the target. The initial guess for the optimization does not affect the final solution, even if the starting commutation angles are randomly selected. The most frequently used maneuver is the combined maneuver, with attitude and momentum maneuvers used as backup for various contingencies. It has also been found that for the combined maneuver, the Lagrangian optimization converges much faster (in three iterations) but diverges when insufficient time is given in which to reach the target. Gas jet maneuvers can be conveniently divided into two classes according to whether the inertial direction of the torque vector is constant or changing during jet firing. Most maneuvers are of the first type and are analytically straightforward. When the direction of the applied torque is constant, the jet can be fired for as long or short a time as necessary to produce the desired change, and prediction of the spacecraft response requires only a straightforward integration of the equation for angular acceleration. The second type of maneuver is represented by precession of a spintting spacecraft using a jet fixed to the spacecraft body as described in Section 1.2.3. Here, the torque vector is approximately perpendicular to the spin axis and rotates at the spiji rate. The jet must be pulsed on and off; otherwise, the torque will average to zero over a spin period. Successive pulses must be controlled by an inertial reference, commonly the Sun vector, to achieve a nqt cumulative motion of the spin axis in the intended direction. where / is the moment-of-inertia tensor, <o is the angular velocity, N is the applied torque, m is the rate of consumption of propellant (m >0 by definition), and / is the perpendicular distance from the spin axis to the thruster. The last term accounts for the angular momentum lost as propellant is expelled, which may be nonzero even if the thruster orientation is such that the thrust produces no net torque. Except for detailed dynamic analysis, it is normally adequate to assume that the angular velocity is parallel to one of the principal axes and that the torque is applied about th's or another principal axis. The time rate of change in the moment of inertia will be included in the following examples, although as noted in Section 7.10, the effects of this term can usually be ignored. which may be used to predict the time required to produce a given change in the spin rate. The value of d will change slightly during a maneuver; this can usually be ignored if an average of initial and final values is used. When the spin rate can be directly measured, and when the spacecraft can be monitored and controlled in real time, an accurate prediction is not required because the maneuver can be extended or terminated prematurely to achieve the desired spin rate. Momentum Unloading. Spacecraft for which all three axes must remain inertially fixed are usually controlled by a combination of gyroscopes and momentum wheels. Secular disturbance torques may change the angular momentum of the spacecraft beyond the capacity of the momentum wheels to compensate. When this happens, gas jets can be used to dump or unload excess momentum, or conversely, to add or load deficit momentum. A jet is fired to produce a torque opposite the direction of the accumulated angular momentum while the spacecraft is commanded to maintain its attitude; the result is that the momentum wheel accelerates -at the rate necessary to counteract the applied torque. A detailed description of this maneuver depends on the control laws governing the momentum wheels and ? gyroscopes (see Section 18.2); the sole function of the jet is to introduce a "disturbance" torque of appropriate direction and magnitude. which is the equation for uniform precession about the — x axis at a rate to= rF/ L. The AE maneuver thruster is aligned so that the thrust vector intersects the z axis as closely as possible so as to generate only precession torques. It is also assumed that the onboard control system will keep the torque vector inertially fixed. This assumption breaks down somewhat in practice, however, and correction maneuvers with the magnetic control system are usually required after the inversion maneuver. Precession of a Spinning Spacecraft. As noted above, attitude control of a spinning spacecraft requires that the control thruster be operated in a pulsed mode, each pulse lasting a fraction of a spin period. Successive pulses are correlated to achieve a cumulative motion of the spin axis, ordinarily by using either the Sun or the Earth as an inertial reference. See Section 1.2.3 for a qualitative description of this maneuver. where Axj/ is the angular change in the orientation of L; A L is the magnitude of the change in L, equal to the impulse N of the applied torque (from Eq. (7-149)), and assumed perpendicular to L; and /to is the magnitude of the angular momentum about the spin axis, i.e., L= lu. The pulse centroid is calculated from Eq. (7-148). The precession torque vector equals rXF, where r is the position vector to the thruster at the time of the pulse centroid, and is parallel to rXL, because only the component of F parallel to L produces a precession torque. The heading angle, 0 = arc cos[(r X L) • (S X L)], where S is the Sun vector, is the rotation angle about L from the L/S plane to the L/r plane. (Sep Fig. 1-11.) In a rhumb line maneuver, the heading is fixed for the duration of the maneuver. This is nominally the case if the thruster pulse time is fixed relative to the Sun detection time, but the heading will vary if the thrust profile or the spin rate changes during the maneuver. The fact that © is nominally constant suggests that a convenient coordinate system for analysis is one in which the Sun vector is parallel to the z axis and L lies in the x/z plane at the start of the maneuver. In this coordinate system, the attitude trajectory or time history makes a constant angle, 0, with lines of latitude as shown in Fig. 19-7. •A thruster may be aligned deliberately to produce a torque component which will cancel the remaining terms in Eq. (19-56) so that ¿=0. Fig. 19-7. Rhumb Line Altitude Maneuver for Constant Heading of 0 = 32° Relative to the Sun. For (he manuever illustrated, /?, = 50°, = 10°, and 153°. The arc length between the initial and final attitudes is 59 deg and the rhumb length is 75 deg. Mercator representation* with the Sun at the pole, as shown in Fig. 19-8 for the same maneuver shown in Fig. 19-7. The heading angle, 0, can be read directly from the rhumb line joining the initial and final attitudes if the horizontal and vertical scales are equal at the equator. Fig. 19-8. 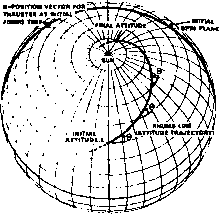 Mercator'Plot of Rhumb Line Maneuver Illustrated in Fig. 19-7. See text for explanation. "The Mercator representation is a conformal mapping devised by Gerhard us Mercator. a sixteenth-century Flemish geographer. Points on (he surface of the sphere are plotted on the x/y plane. 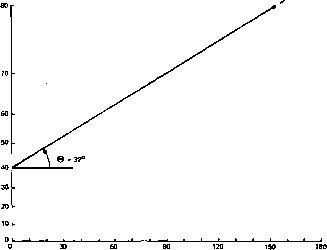 Longitude is plotted directly on the x axis, but - log,(lan($/2)), where <j> is the colatitude, is plotted on the r axis. A straight line connecting any two points on the map is a ¡oxodrome or rhumb line, a line making a constant angle with both parallels and meridians, which made the Mercator map useful lo early terrestrial navigators. The rhumb length, X, is the arc length between the initial and final attitudes along the rhumb line and is greater than or equal to the arc length of the great circle joining the two points. The values of 0 and X for a rhumb line maneuver can be calculated from the initial and final attitudes in the coordinate system with the Sun at the pole from where /?, and pj are the initial and final coelevation angles, respectively (measured from the Sun), of the spin axis in this coordinate system; is the final azimuth angle (in radians); and the initial azimuth angle is zero by definition of the coordinate system. (For a derivation, see Williams .) The algebraic signs of the numerator and denominator of Eq. (19-62) correctly indicate the quadrant of 0, which has a range of 360 deg; if is zero, 0 is +90 deg if the numerator is positive and - 90 deg if the numerator is negative. Although the rhumb length X is longer than the arc length between the initial and final attitudes, the difference is small for short arcs, rhumb lines near the equator, or rhumb lines heading nearly directly toward or away from the coordinate system pole. Where the difference is significant, a great circle maneuver can be approximated by a series of short rhumb lines. Equations (19-62) and (19-63), and the inverse equations for Pj and can be used for an ini'ial prediction of the commands required to perform a particular maneuver and to determine the resulting trajectory. A pulse-by-pulse simulation can then be used to refine the computation based on the amount by which the simulated final attitude misses the required final attitude. A miss may occur because spin rate or pulse characteristics are known to change during a maneuver, or simply because the resolution of the control system does not allow arbitrary heading angles or arc lengths to be generated. A Mercator plot of the attitude trajectory can be used to monitor the progress of a maneuver if data can be obtained and processed in near real time. If attitude points lie on the predicted trajectory but do not progress toward the final attitude at the predicted rate, the maneuver can be lengthened or shortened and subsequent predictions adjusted proportionally. If attitude points lie off the predicted trajectory, a correction maneuver will be required, and the computation of the pulse centroid will have to be modified. If all subsequent maneuvers are performed at the same spin rate with the same pulsewidth, a constant adjustment is indicated. If maneuvers are performed at different spin rates, it may be found in some cases that the pulse timing is incorrect, in which case the centroid angular error will depend on spin rate; in other cases, the orientation of the thruster relative to the Sun sensor is incorrect, leading to a centroid angular error which is independent of spin rate. Inertial guidance maneuvers use only information obtained internally from gyroscopes or accelerometers. On 1UE, for example, the telescope is commanded to move from one target to another with the maneuver execution based only on control error signals derived from rotation rates sensed by a set of gyros. (The terminal phase, however, uses data from a star tracker operated as a finder telescope.) The actuators for inertial guidance maneuvers are usually reaction wheels, although gas jets may be used instead, as on HEAO-1 (see Section 18.3). The reaction wheels may be commanded to perform a maneuver by a sequence of single-axis slews as on OAO and 1UE or by simultaneously maneuvering all three axes as planned for HEAO-B. A single-axis slew, in which the spacecraft body rotates about a fixed axis, can be executed by transferring momentum from a wheel to the body, causing the body to rotate about the wheel axis. The rotation rate is controlled with rate feedback information from gyros to provide damping to avoid overshooting the target. The required slewing time depends on the wheel capacity, the current momentum bias (even in a nominal zero-bias system), and any attitude or attitude rate limits which may be imposed. Figure 19-9 is a diagram of torque, wheel momentum, body rate, and angular position for an -idealized system. 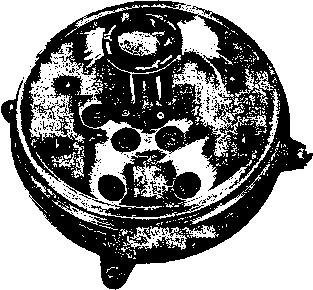 At time t0 a new angular position is commanded, and the torque motor goes full on. The wheel momentum increases linearly with time until either the maximum permissible body rate or wheel momentum is reached at time <,. During this time, conservation of angular momentum requires the body rate, dff/dt, to decrease linearly, causing the position angle, 0, to change quadratically with time. The body rate remains constant until time t2, when a braking torque is applied to slow the body rate to approach the target position angle with a small angular velocity. After approximately reaching the target at time /3, the terminal phase involves the elimination of small residual errors by the stabilization control system as described in Section 18.3. When the control system, illustrated in Fig. 19-9, is implemented in discrete form (i.e., computer controlled), modifications are required from the analog position-plus-rate law to optimize the maneuver performance and minimize the computational requirements. An on-off or bang-bang type of impulsive control is preferred because it simplifies the actuator electronics by eliminating the need for continuous control and reduces the required sampling rate. Even for a discrete control system, however, the stability and optimization analysis are usually performed for the continuous case. Fig. 19-9. 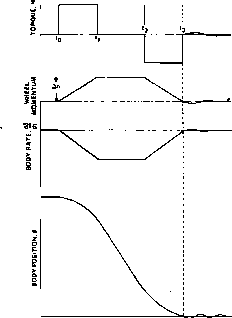 Example of a Single-Axis Slew Maneuver. See text for explanation.